As we have moved farther west, we have encountered more fish and are therefore completing more trawls. 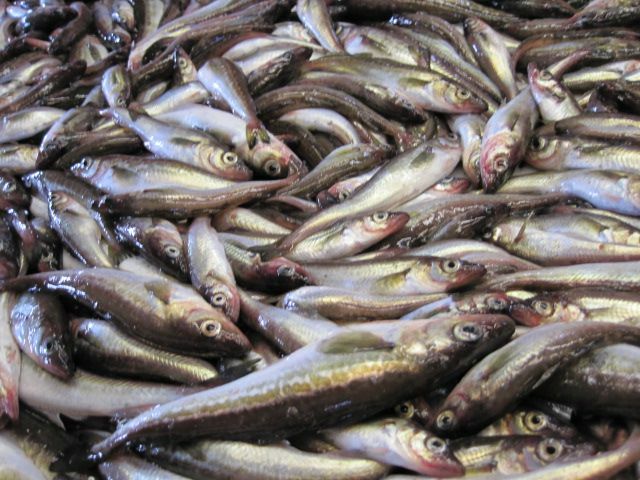 Yesterday was our biggest day so far and we completed two trawls for pollock (referred to as AWTs for Aleutian Wing Trawl) and one Methot during our 12 hour shift (with more fishing done in the next shift). Our first trawl started at the beginning of our shift and we hustled to finish processing before breakfast. To help keep our spirits up, Abby, Michele, Katie, Robert and I rocked out to some 80s tunes as we sorted and processed fish. Imagine the five of us bopping around the lab, in our foul weather gear, with scalpels in hand, while Rick Springfield wishes he had Jessie’s Girl, all before sunrise. Even though we completed three hauls, I still had time to work on my “Run Across Germany” (for Chuck Norris Snuggle Muffin) and to spend time with the mammal observers. As I mentioned before, marine mammal observers have to be extremely patient. I spent about an hour and a half with them yesterday evening and saw two groups of whales through the big eyes (which was more than average). One was clearly a group of 2-3 fin whales while another was an unidentified blow. The marine mammal observers mark all sightings in a data program with a mapping function that then predicts where the cetaceans might be moving so the observers can identify whether future sightings are the same or new animals. They might see two or three sets of blows before they spot any part of the body which could help them identify it. 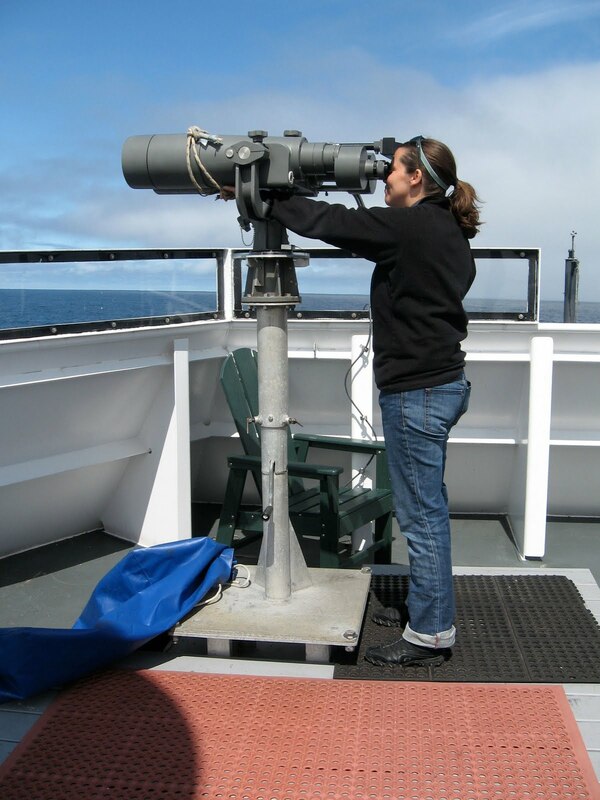 Fin whales come up to the surface once every 8-10 minutes and it took until the third set of blows before marine mammal observer Paula Olson was able to identify them (I got to see them on the fourth surface visit). While we were waiting for the fin whales to come up again, Paula explained that in our part of the Bering Sea, there are five cetacean species that we are most likely to see. We determined that with the fin whale sighting I have already seen three (killer whales, Dall’s porpoises, and fin whales) leaving me with two species to scope out before we leave (minke whales and humpback whales (you know, like Humphrey)). Hopefully the weather will stay clear and I’ll be able to spend some more time on the flying bridge.